Oxford University Press, USA, 9780199844425, 257pp. The forty-percent drop in crime that occurred across the U.S. from 1991 to 2000 remains largely an unsolved mystery. Even more puzzling is the eighty-percent drop over nineteen years in New York City. Twice as long and twice as large, it is the largest crime decline on record. In The City That Became Safe, Franklin E. Zimring seeks out the New York difference through a comprehensive investigation into the city's falling crime rates. The usual understanding is that aggressive police created a zero-tolerance law enforcement regime that drove crime rates down. Is this political sound bite true-are the official statistics generated by the police accurate? Though zero-tolerance policing and quality-of-life were never a consistent part of the NYPD's strategy, Zimring shows the numbers are correct and argues that some combination of more cops, new tactics, and new management can take some credit for the decline. That the police can make a difference at all in preventing crime overturns decades of conventional wisdom from criminologists, but Zimring also points out what most experts have missed: the New York experience challenges the basic assumptions driving American crime- and drug-control policies. New York has shown that crime rates can be greatly reduced without increasing prison populations. New York teaches that targeted harm reduction strategies can drastically cut down on drug related violence even if illegal drug use remains high. And New York has proven that epidemic levels of violent crime are not hard-wired into the populations or cultures of urban America. 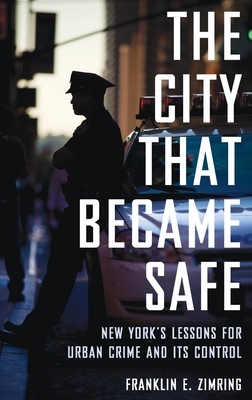 This careful and penetrating analysis of how the nation's largest city became safe rewrites the playbook on crime and its control for all big cities. Franklin E. Zimring is the William G. Simon Professor of Law and chair of the Criminal Justice Research Program at the University of California, Berkeley. Since 2005, he has been the first Wolfen Distinguished Scholar at Boalt Hall School of Law. Professor Zimring's recent books include The Great American Crime Decline and The Next Frontier (with David T. Johnson) .